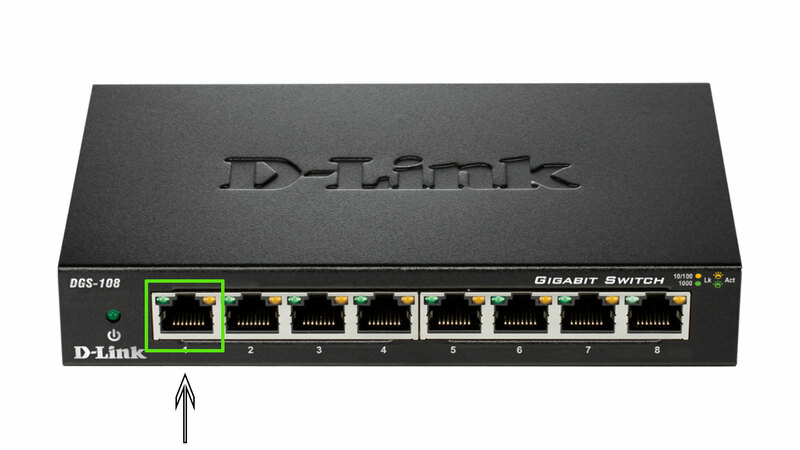 A free Ethernet port on your switch or a free LAN port on your router. Locate the Ethernet port on your Enplug device. Connect one end of your Ethernet cable to the Ethernet port on the device. Connect the other end of the Ethernet cable to an empty port on your switch. After connecting the device and switch with the Ethernet cable, the rest of process will usually be automatic and your Enplug device should be connected to Internet. - In most cases establishing the internet connection is automatic upon connecting the devices with the cable. If your router has a disabled DHCP, the connection process will not be automatic and requires setting a Static IP address on your device. - If you are using VLANs be sure to configure them properly so the device can reach the Internet. - The Enplug device does not support 802.1X, Port-based Network Admission Control, System Health Validators, or IPSec . - You should not give you Enplug device a public IP address. Use only non-routed private IP addresses as described in IETF RFC 1918 such as 192.168.x.x.